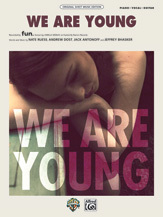 We Are Young, written by indie pop band fun. in collaboration with producer Jeffrey Bhasker, was already a massive hit as a result of its feature on the TV show Glee. But the song exploded to global popularity with the release of fun. 's second studio album, eventually reaching No. 1 on the charts. This licensed, collectible seven-page piano arrangement captures all the essentials of the studio recording, with lyrics, complete vocal melodies, and basic guitar chord grids included.